Latvian conductor Andris Nelsons, who became the Music Director of the Boston Symphony Orchestra in 2014 (his contract has been extended until 2022), has released his first recording with the orchestra entitled Shostakovich – Under Stalin’s Shadow – Symphony No. 10 on the Deutsche Grammophon label (DG 479 5059, 2015). Nelsons, who has also conducted the City of Birmingham Symphony Orchestra, will also be the Gewandhauskapellmeister of the Gewandhausorchester Leipzig in 2017. The CD contains live recordings of Russian composer Dmitri Shostakovich’s Passacaglia (from Lady Macbeth of Mtsensk) and Symphony No. 10 in E minor. 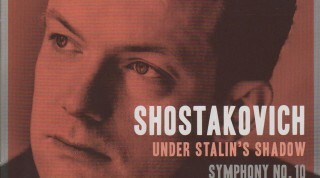 The record is subtitled Under Stalin’s Shadow, as Shostakovich (1906 – 1975) was often in conflict with the Soviet dictator. Shostakovich fell out of favor with the dictator after Stalin himself attended a performance of Lady Macbeth of Mtsensk and openly expressed his displeasure. Shortly afterwards, the infamous Muddle not Music article denouncing the opera appeared in the Pravda newspaper (which, if not written by Stalin himself, was written with his active input) and the opera was banned and Shostakovich himself became persona non grata in the Soviet regime. Symphony No. 10 was Shostakovich’s first symphony after the death of Stalin in 1953, and the harsh second movement has been interpreted as the composer’s own impression of Stalin, and the symphony overall has many themes of personal identity. This release is meant to begin a series of Shostakovich releases by Nelsons and the BSO for Deutsche Grammophon – subsequent releases will feature symphonies No. 5, 8, and 9 (2016), as well as Symphonies No. 6 and 7 (2017). For further information, please visit Andris Nelsons’ website and the Boston Symphony Orchestra website and the Deutsche Grammophon Andris Nelsons page.